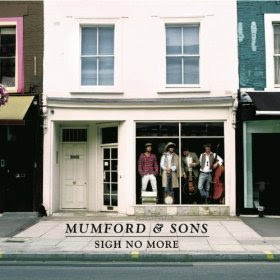 I'm a little late getting to the review and now more and more folks have heard of the Sigh No More, the debut disk from Mumford & Sons, especially after their impressive performance on the Grammys last month. At least I thought they were impressive. No studio trickery or wizardry, just talent. And from four guys from London all under 25 years old. I like their harmonies and their playing. The songwriting is ok to be sure and maybe just not more than ok......but again, they are young. The problem for me is that for the most part, the disk is pretty one note. Too many of the songs sound the same. It's hard for me to tell some songs apart. At least with a group like Great Big Sea you get variety. I don't feel that way here. That all being said, I still don't mind the overplayed "Little Lion Man" and I still really really like "The Cave". Are they enough for the purchase of the entire disk? Overall, I'd say "no". It's not bad, the not so bad just needs some growth. Way to drive up readership...Record of the month right after Music Monday. I like most of the songs, but I have to admit that when the CD swung from last to first track, I thought it was the same song.